Clifton Dowlin was the older of Luther Dowlin’s two sons. Trego posed him in profile, sitting on a chair with his hands folded in his lap. While Trego painted portraits of the youngest Dowlin child, Norris, and both Luther Dowlin and his wife, Martha, he does not seem to have created finished portraits of Clifton or his sister, Mae. 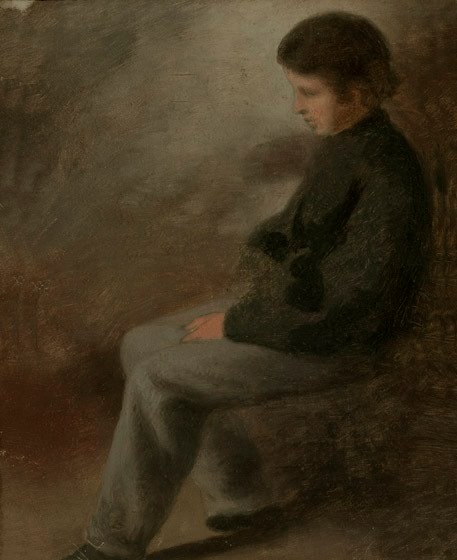 This study was commissioned by Luther Dowlin, father of the subject. It has been passed down through the family of his descendants and is currently in the possession of Dowlin’s great-grandchildren. While the painting seems in good general condition, it has been framed under glass for several decades and is possibly being harmed by that fact.